The Chariot ~ Go After Your Dreams! Tarot Tuesday! The card for the week is the Chariot, representing: Ambition, intuition, forward-movement, self-realization and new beginnings. The Chariot indicates an empowered moment, for here we emerge from the watery seas of the unconscious onto solid ground. This is a journey of self-realization, as we embody our dreams and desires, filled with the ambition to make them real. Some call the Chariot a “movement of the soul”, and so it is, for on this voyage we begin to take charge of our destiny, with our intuition to guide us. My Chariot includes a map of Paris. I took the plunge and booked a trip to Paris for my birthday in October. I have always dreamed of being in Paris, one day I woke up and everything in my being said—go for it! The Chariot is a call for action. A time to gather your courage and go after your goals. There is no game plan, for it would only limit you. Rather, you are “making it up” as you go, requiring you to trust your deeper instincts. It is your intuition—a sense of knowing--that propels the Chariot forward. 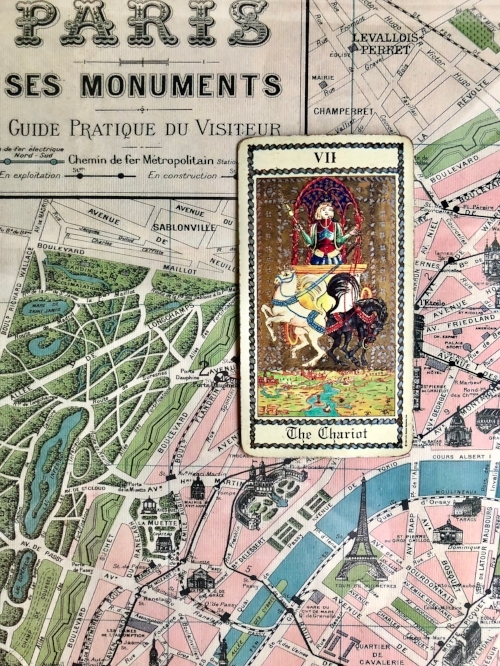 The Chariot reminds us that no matter the destination, what is important is the journey itself. Much like the mythologicalHero’s Journey, the Chariot is an opportunity to define your character, even in the face of unknown elements or adversity, while staying true to yourself. Wishing you an empowered week! The Eight of Swords ~ Don't Go Mental!